With a sleek aluminium body, a live home screen that streams all of your favourite content, a photo gallery that comes that comes to life, and dual frontal stereo speakers, this silver HTC One Mini is ready to reshape your smartphone experience. The HTC One Mini brings you a sleek full metal body with zero gap construction and tapered edges that offers a slim but satisfying grip. The beautiful 4.3" full HD 720p screen is protected by HTC's innovative infinity glass that eliminates glare and resists scratches. Which means its stunning looks will actually stay stunning- now and in the future. With HTC BlinkFeed on your phone, you’re never out of touch with your world. Simply pick the social networks, news and feeds you want to stay updated on and they'll stream live to your home screen. The home screen can also contain the latest updates on your friends, photos, social networks, calendar events and more. Other Smartphones may struggle when it comes to sharing music or videos with friends due to their tiny speakers taming even the most ferocious track. HTC BoomSound changes all this due to dual frontal stereo speakers powered by built-in amplifiers that delivers a bigger sound with less distortion. Capturing a moment takes more than one image. 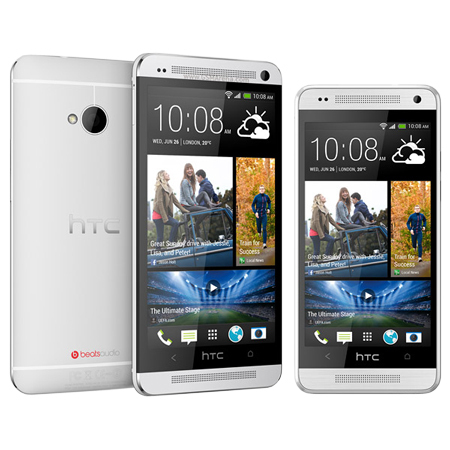 That's why the new HTC One Mini includes the HTC UltraPixel Camera. With a simple press of the shutter and the HTC One Mini automatically captures up to 20 photos and a 3-second video. This creates an entire photo album that becomes a living, breathing gallery. The HTC One Mini makes sure that the images you do catch are the best by capturing 300% more light on the HTC's super sensitive camera. The HTC One Mini's camera dramatically increases photo quality, clarity and contrast and detail. The new HTC One Mini is ready to help you channel surf. With Sense TV, all it takes is a few simple steps and you’ll be able to select TV channels, access program guides, adjust audio and more with your HTC One Mini. Find your favorite shows, and it will notify you when they’re on. Talking on the phone in any loud, crowded environment can be a challenge. The new HTC One Mini solves that problem with Sense Voice. It includes dual built-in microphones that detect loud ambient noise and will then dynamically boost the in-call voice to compensate giving you clear uninterrupted conversations. This SIM free handset is unlocked and compatible with any 2G/GSM or 3G SIM card. Some network & 3G specific services may be unavailable with this handset. Product images are for illustrative purposes only, specific colour variants cannot be guaranteed unless otherwise specifically stated on the page.